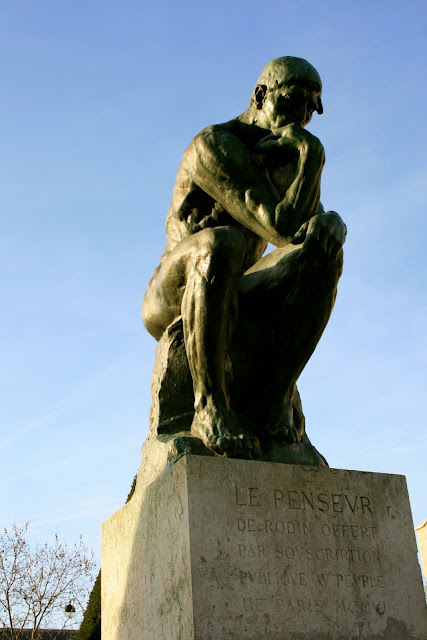 Before I left for Paris in 2007 my aunt told me, "If you can only see one museum/gallery while you're in Paris, make sure you visit the Rodin Museum." I was in Paris for over 2 months, so I had plenty of time to visit galleries and museums (and I did visit many, and a few more than once! ), but the Rodin Museum was one of my favourites, and as my aunt said, it's a place not to be missed on a visit to Paris. Located in the 7th arrondissement of Paris, not far from La Tour Eiffle and right next to La Place des Invalides, the peace and serenity of the museum and its garden sit in stark contrast to the hustle and bustle of the surroundings. It sits on the corner of Le Boulevard des Invalides, a wide, busy, congested Parisian boulevard, and rue de Varenne, a cute little side street, around which people queue to enter the museum. I went on a busy day, the first Sunday of the month, when all the galleries and museums in Paris wave their entry fees. This is such a fantastic idea, one of many of the French government regarding the cultural life of the city, as it allows the museums and galleries of Paris to be accessible to everyone, even tempting those who would not usually visit them to explore their wonders. One the opposite corner is the Cafe du Musee, a typical Parisian brasserie serving drinks, snacks and light meals. Even on a cold winter's day people sat outside, drank their cafe, smoked their cigarettes and read le journal. Being in Paris in the winter, meant that I escaped the hoards of tourists and was able to experience all those wondrous things that make Paris, Paris, not matter how great or insignificant, as if I was just another Parisian. The Hotel Biron (above) which now houses a collection of Auguste Rodin's amazing sculptures, was built between 1728 and 1730 by the architect Jean Aubert, under the commission of Abraham Peyrenc de Moras. The 'chateau' went through a number of different ownerships until the early twentieth century. There were plans to have the building demolished, and in the interim, a number of artists, including Rodin, took up residency in the then almost dilapidated site. In 1911, the state bought the building. Rodin, wanting to convert the building into a museum of his works, with the support of his peers, made a deal with the Parisian government to dedicate the Hotel Brion as a museum devoted to his sculpture in return for his entire collection. The deal was sealed on 24th December, 1916, and the museum opened in 1919, allowing the public to appreciate the work of such a fantastic artist in a breath-takingly beautiful space. 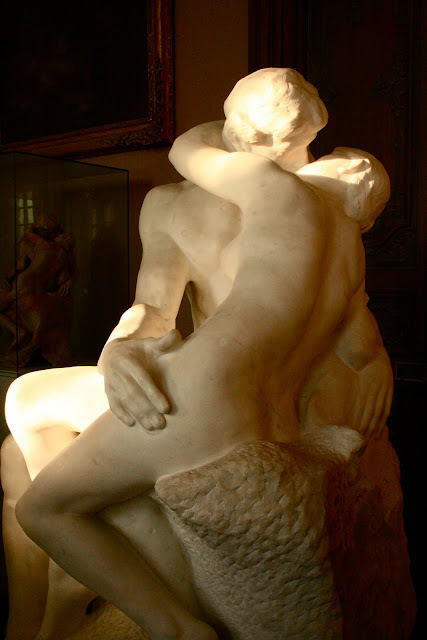 Auguste Rodin, is one of France's and the world's most celebrated sculptors. Although he was traditionally trained, he turned his back on mythical and allegorical subject matter, which were the traditionally accepted forms at the turn of the 20th century, favouring a realistic depiction of the human body in his clay and bronze sculptures. He was not afraid to explore human emotions such as passion, distress and weakness, allowing his works to accurately represent the psyche of his subjects. Many of his well known sculptures, including Le Penseur (The Thinker) and Le Baiser (The Kiss), can be found in the museum and its gardens. He also created a number of amazing sculptures of his contemporaries, including Blazac and Victor Hugo, which are not to be missed. Seeing photographs of these sculptures do them no justice what so ever - the expressions on their faces, the formation of their poses, the expression and feeling Rodin was able to render from a piece of clay or bronze is phenomenal. You have to see these sculptures close up in order to get any idea of the true genius of the artist.